Durasense nitrile examination gloves are made of a durable thin nitrile material that provides maximum protection while maintaining its comfort and sensitivity for extended periods of time. These gloves offer a textured finish to promote slip resistance in wet or dry conditions. 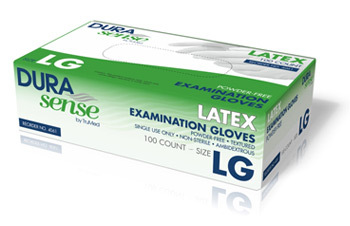 Durasense latex examination gloves provide strong and durable protection while utilizing the superior comfort and conformability of latex. The gloves textured surface provides improved gripping characteristics in wet or dry conditions.